A recent model by Lee et al. (2007) based on combined morphological and molecular data. Clades in bold are especially robust. Scolecophidia. Various names were proposed in the 19th and early 20th centuries for essentially this group, comprising the small-mouthed, fossorial ‘blind snakes’, ‘worm snakes’ and ‘thread snakes’. The most widely used term (Scolecophidia) was coined as an informal name by Duméril and Bibron (1844), later adopted formally by Cope (1864), and has been used for the past half-century with almost no variation in content (Lee & Scanlon, 2002). The name is here defined as a node-based entity, the most recent common ancestor of Leptotyphlops albifrons, Anomalepis mexicanus, Typhlops lumbricalis, to the exclusion of Anilius scytale, Uropeltis ceylanica, Tropidophis melanurus and Coluber constrictor. These species are all the type species of their eponymous Linnaean ‘families’ (McDiarmid et al., 1999). Morphological diagnosis: see Lee and Scanlon (2002). Alethinophidia. This term was first used by Nopcsa (1923) to comprise all modern snakes other than scolecophidians (which Nopcsa termed angiostomatans); both of these extant branches were proposed to be derived from an implicitly paraphyletic assemblage of extinct basal snakes (Cholophidia; Nopcsa, 1923). Alethinophidia is here defined as a node-based entity, the most recent common ancestor of Anilius scytale, Uropeltis ceylanicus, Tropidophis melanurus, and Coluber constrictor, to the exclusion of Leptotyphlops albifrons, Anomalepis mexicanus, Typhlops lumbricalis. These species are all the types of their eponymous Linnaean ‘families’ (McDiarmid et al., 1999). Morphological diagnosis: see Lee and Scanlon (2002). Caenophidia. This term was first used as part of Hoffstetter’s (1939) grade-based subdivision of Alethinophidia whereby primitive members were termed henophidians, and forms seen as more ‘specialised’ or ‘advanced’ (e.g. see Nopcsa, 1923) were termed caenophidians. As with many ‘horizontal’ divisions, the primitive grade was explicitly paraphyletic and not now formally recognised, but the advanced grade coincides with a clade. Caenophidia is here de ined as a node-based entity, the most recent common ancestor of Acrochordus javanicus, Vipera aspis and Coluber constrictor to the exclusion of Bolyeria multocarinata, Boa constrictor, Python molurus and Uropeltis ceylanicus. These species are all the types of their eponymous Linnaean ‘families’ (McDiarmid et al., 1999). Morphological diagnosis: see Lee and Scanlon (2002). Phylogenetic relationships of Caenophidia based on Cadle (1987, 1994), McDowell (1987), Underwood and Kochva (1993), Knight and Mindell (1994), Heise et al. (1995), Kraus and Brown (1998), Zaher (1999), Vidal et al. (2000) and Vidal (2002). Traits: S, supralabial secretory serous cells; D, differentiated maxillary dentition. Terminal taxa written in bold possess a front-fanged venom system. Caenophidia other than Acrochordidae and lacking a front-fanged venom system are traditionally classified as 'Colubridae'. Pseudoxenodontines and homalopsines are not shown (unknown phylogenetic relationships). Maximum-likelihood tree recovered from analysis of 1545 bp of mitochondrial DNA sequence spanning the 12S and 16S genes.Taxa in bold traditionally were placed in Tropidophiidae. Tree shown with support values from Bayesian analysis (above the branches)and nonparametric bootstrapping (below the branches). Xenophidion was not included in this analysis because DNA samples were not available. After Wilcox et al. (2002). Phylogenetic tree of snakes based on mitochondrial 12s and 16s rRNA sequence data (8 18 aligned sites). An iguanid lizard (Sceloporus undtdatus) was included, and the tree was rooted with a tuatara (Sphenodon pzmtatzu). The tree was constructed using neighbor-joining with the Jukes-Cantor distance (scale bar). Confidence probability values are given for each branch. Phylogenetic relationships of snakes based on C-mos, 12-16S rRNA and cytochrome b sequences (bootstrap ME consensus tree, 2000 replicates, values above 50% are shown). Terminal taxa written in bold are fossorial (non macrostomatan). The C-mos alone analysis gives an alternative topology where the two 'anilioid' lineages are not basal alethinophidian snakes, but basal henophidian snakes. Phylogenetic relationships of Caenophidia based on C-mos, 12-16S rRNA and ND4 sequences (bootstrap ME consensus tree, 2000 replicates, values above 50% are shown). Traits: S, supralabial secretory serous cells; D, differentiated maxillary dentition. Terminal taxa written in bold possess a front-fanged venom system. Geographic distribution: problems in phylogeny and zoogeography, in: R.A. Seigel, J.T. Collins, S.S. Novak (Eds. ), Snakes: ecology and evolutionary biology. Macmillan Publ., New York, pp. 77-105. The colubrid radiation in Africa (Serpentes: Colubridae): phylogenetic relationships and evolutionary patterns based on immunological data. Zool. J. Linn. Soc. 110: 103-140. On the characters of the higher groups of Reptilia - Squamata - and especially y of the Diploglossa. Erpetologie Générale ou Histoire Naturelle Complete des Reptiles. Vol.6. Snake relationships revealed by slowly-evolving proteins: further analysis and a reply. On the phylogenetic relationships of Colubrinae, Elapidae and Viperidae and the evolution of front fanged venom systems in snakes. Snake phylogeny based on osteology, soft anatomy and ecology. Systematics. In: R.A. Siegel, J.T. Collins, and S.S. Novak (eds. ), Snakes: ecology and evolutionary biology. 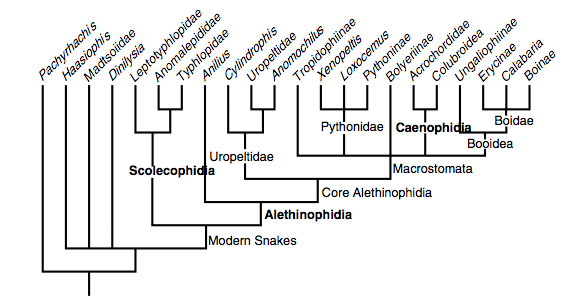 Phylogenetic relationships of colubroid snakes based on mitochondrial DNA sequences. Zool. J. Linn. Soc. 122: 455-487. Snakes of the World - A Checklist. 2. Boas, Pythons, Shield-tails and Worm Snakes. R & A Research and Information Ltd and KCM Books. Visceral anatomy of the Malaysian snake genus Xenophidion, including a cladistic analysis and allocation to a new family. Phylogenetic relationships of the dwarf boas and a comparison of Bayesian and bootstrap measures of phylogenetic support. Phylogenetic relationships of xenodontine snakes inferred from 12S and 16S ribosomal RNA sequences. Mol. Phylogenet. Evol. 14 (2000) 389-402. Colubroid systematics: evidence for an early appearance of the venom apparatus followed by extensive evolutionary tinkering. J. Toxicol. Toxin. Rev. 21 (2002) 21-41. Higher-level relationships of snakes inferred from four nuclear and mitochondrial genes. Higher-level relationships of caenophidian snakes inferred from four nuclear and mitochondrial genes. Hemipenial morphology of the south American Xenodontine snakes, with a proposal for a monophyletic Xenodontinae and a reappraisal of colubroid hemipenes. Academic Press San Diego, London, [...]XIV + 630 pp.